The State of Alaska map is accompanied by a separate county map, with the names of all counties in the "49th State". The Map of Alaska and county map, that has 27 counties, provide the location and the names of all the regions and districts in the State. The spirit of the state is reflected in the Alaska state motto, an interesting piece of information if you are travelling, going on vacation or simply learning about the State. The Map of Alaska provides an outline of its jurisdiction, which covers 656,425 sq. miles. Test your recognition skills and knowledge with our State Maps Quiz Game. 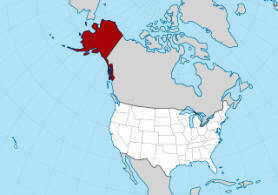 The State of Alaska is located in the far northwestern North America in the Artic and Sub-Arctic regions. The following facts and information provide a map of Alaska with counties, together with a helpful list of Alaska counties. The power of a county arises from state law and these vary according to each state. In America a county was among the first units of local government established in the 13 Colonies that would eventually become the United States of America. 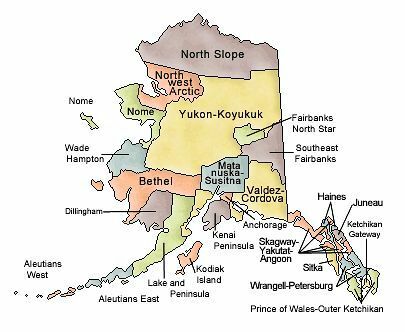 Find the location and names of all the Alaska counties. The term "county" is used in 48 of the 50 U.S. states. Alaska and Louisiana are the exceptions, they are called parishes in Louisiana and boroughs in Alaska. 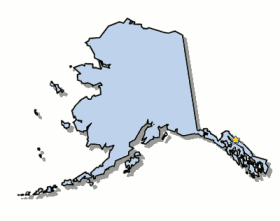 In Alaska, a civil division corresponding to a county in other States, is called a Borough. Counties, or a county, was (and still is) the term used for lands in England and originally meant the lands of a count or earl. Counties were the earliest units of local government established in the first 13 Colonies that would become the United States. A Borough was (and still is) the term used in England for an incorporated town, that is not a city, that sends members to parliament . The word originates from the old Anglo Saxon word 'Burgh'. This dates back to the times of King Alfred the Great (849 - 899) who introduced a National Defence system by the formation of 'Burhs' or 'Burghs' which means "fortress". The 'burghs', later called 'Boroughs', were developed as a community effort to defend and act as a refuge against the Vikings. The Map of Alaska provides an outline of the state and the Alaska County Map provides the name of all of the counties in the state. The Government of the United States is based on the concept of federalism, meaning self-governing units. Power is shared between the National Government and State Governments, such as Alaska, and defined by the Constitution of the United States of America. The State Borders, or State lines of Alaska, define geographic boundaries between each state.